Pyramides in Necropole Gizensi sitae. Pyramides Aegyptiae sunt maxima pharaonum sepulcra. Sunt in Aegypto plus quam centum pyramides, plurimae in regnis Vetus et Medio aedificatae. 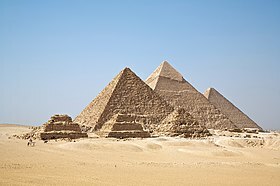 Prima pyramis est pyramis graduum Tosorthri in Saqqara, ab Imhotepe aedificata. Longe notissimae sunt pyramides Gizenses, quae inter aedificia maxima mundi habentur et sola e septem miraculis mundi quae adhuc exstant. Herodotus, rerum gestarum scriptor, servos pyramides aedificavisse scripsit, sed haec notio nunc falsa habetur. Auctores Christiani pyramides horrea Iosephi (secundum librum Genesis 37ss.) censuerunt. Haec tabula pyramidum notarum ordinem temporum servat. Edwards, I. E. S. 1991. The Pyramids of Egypt. Nova ed. Penguin Books. ISBN 9780140136340. Lehner, Mark. 1997. The Complete Pyramids. Londinii: Thames & Hudson. ISBN 9780500050842. Mendelssohn, Kurt. 1974. The Riddle of the Pyramids. Londinii: Thames & Hudson. ISBN 9780500050156. Novissima mutatio die 27 Februarii 2018 hora 02:42 facta.